A Chicago private yacht rental for your family and friends cruising Lake Michigan aboard Adeline’s Sea Moose will certainly add more fun and flavor to your Taste of Chicago experience, along with some fantastic stories to share year after year. What is the city’s recipe for a fantastic food festival? Chefs and musicians, combined with entertainment for all ages and several thousand tasting servings of favorite Chicago bites. 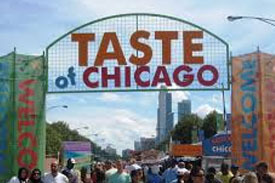 Fill up on all flavors of Chicago — from classic local dishes, to specialty cuisines from ethnic neighborhood restaurants, to inspired chef creations — at the annual lakefront festival Taste of Chicago. Then top it off with musical talents every evening. The quintessential summer event, Taste (as it’s known to the locals) appeals to all of your senses: Smell and Taste the best of Chicago’s booming restaurant scene; See culinary experts share their secrets at daily cooking demos; and Hear music artists as they take to the big stage of Petrillo Music Shell. Iconic Buckingham Fountain, dazzling Lake Michigan and the magnificent skyline form the backdrop to the five day event in Grant Park. Plan your trip today, and be sure to bring an appetite!